Discussion in 'Member Tanks' started by NotASpammerDude, Jan 2, 2019. 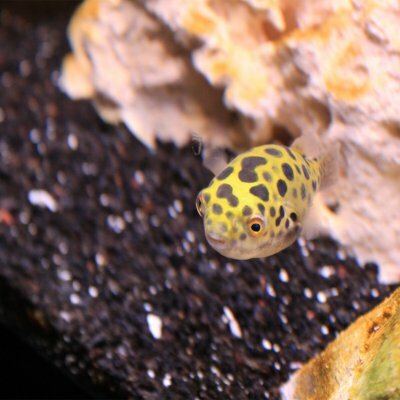 Will be single species Green Spotted Puffer tank (w/ a few mollies). The right third of the tank is has a plenum and return flow going into it a la a RUGF/RDSB. ccombs, Hemmdog, Subsea and 3 others like this. I am now settled on turning the tank into a single species Green Spotted Puffer tank (w/ a single Sailfin Molly that I can't get rid of, nor want to). I've setup an eggcrate plenum w/ pvc risers on the right third of the tank, w/ a 1/2" PVC and airline hose feeding into the bottom. This will likely be turned into a RUGF once I get the flow figured out (likely the 1/4" hose will be fed some low flow). arag-alive hawaiian black for the left side (will be vaccuumed out into a 1" depth) and arag-alive Natural Reef on the RUGF side (will be adding aragonite sand on top to increase depth). 10lbs of Caribsea dry rock and several lbs of black lava rock (that may be eventually removed). 1 large rock painted with drylok basement waterproofer. Various chemical and mechanical filtration (purigen, phosguard, sponge, filter floss, activated carbon). Cool set up! Will be interesting to see how it develops! Hemmdog, Jomama, Captain Quint and 1 other person like this. Some diatoms are growing on the tops of the dry rock, that's where I poured most of the Pink Helix formula while the rock was exposed during a WC earlier today. This Zeolite is like 12 bucks for 10 lbs... and it's clinoptilolite mined out of Iowa... super cheap and I think it's at least 95% pure zeolite (5% inpurities i.e. dirt etc) and 0% extra ingredients. So... for a freshwater system it's super good, but I know it's not clinical like many reef setups require. We'll see how it goes. Rinsed it well with distilled water, very dusty. I want to help fight the diatoms that are growing on the rock, so today I added some live phytoplankton I had leftover from raising amanos several months back. I don't mind having green water if it means diatoms won't be able to grow on the rock, which I hope will give the coralline algae spores more leverage to outcompete the diatoms. Also, a few days ago I attached the RDSB flow plumbed off the main return line. 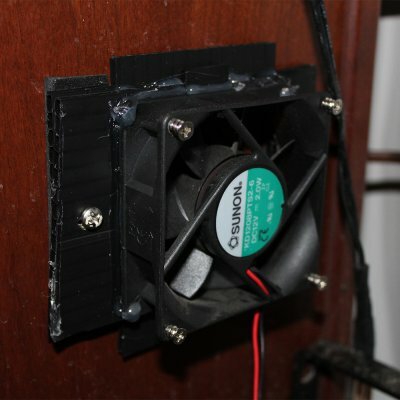 It's just a 1/2" outlet that goes to a 1/4" push to connect, feeding a 1/4" black silicone air hose line that feeds down into the plenum. It's not much flow, I imagine 10gph at most, but it's better than nothing... I may end up using the 1/2" pvc to feed the RDSB flow instead at some point, but probably not for a while. the diy ATO I made malfunctioned because the switches are ebay knock offs... they will switch on but not switch off, so overnight the sump got filled to the brim, but no flooding. I will need to buy some new switches... name brand this time. Specific gravity is at 1.020 right now... so I'll be adding salt water to refill evaporation until I get it a bit higher, 1.023. I've been thinking about eventually adding livestock... with the understanding that the tank is pretty much at bio-load capacity as it stands. So in the immediate term, it turns out my 2 Sump mollies are parents now, the larger female gave birth over night and I have about 8 molly fry living in there. So that's update number 1 for today. 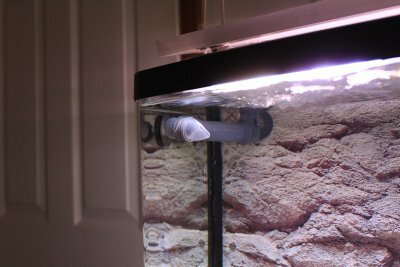 Update number 2 (DIY): is that I am now working on adding a nano fuge to the sump, just throwing around ideas ATM. Well actually I have a working "prototype" in their right now as you can see in the photo above, I don't have huge expectations for it, but it's a start. The main goal of the fuge will be to grow copepods and secondarily nutrient export via chaeto. So what I did for the immediate term is add a 1 Gallon jug with about 4 inches of substrate (Aragonite Sand + Seachem Flourite + Clinoptilolite Zeolite). The Flourite is added to increase iron for anoxic bacteria to grow in the jug eventually, I am expecting it will take about 6 weeks before any denitrification occurs. The Zeolite is added some what randomly on top, just to help remove ammonia and eventually, once saturated, it will just act as "inert media" on which aerobic bacteria will grow. I may need to redesign this "nano fuge" at some point to optimize water flow, including adding a plenum just as a water cushion, but the jug is removable and about 80 cents to buy so no harm done right now. 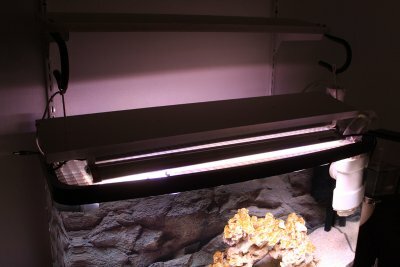 I am using a flourscent tube desk lamp (about 10watts) right now but I want to add a spot light instead so that the light is focused on the "nano fuge" and thus reduce algae growth indiscriminately in the sump. In addition to the "nano fuge" I went to pick up some copepods (tiger pods) from a LFS but they did not have them in stock, so I will check again tomorrow and hopefully get a fresh batch by the end of this weekend. DIY Update number 3 (DIY): I added a 1/2" CPVC gate valve to the return plumbing which feeds a 1/2" hose into the DT's plenum. Previously, I had a 1/4" hose plumbed out of the return line and into the plenum but I was afraid that the flow was way too low to make any impact on "detritus ejection" from the RDSB/plenum. I am really happy with this implementation because the gate valve was only 4 dollars at home depot (plus a few connecters like FHT to 1/2" FNPT) and it's a Gate Valve! Which is widely considered better than ball valve (easier to operate etc). HD also sells 3/4" CPVC gate valves and I am considering adding some to the tank's plumbing in the future or for any future projects such as possibly a standalone refugium. Anyway, now my RDSB has potential for higher flow and I can also shut off all flow if needed, the only problem is I have very little ways of testing the impact of the flow to the RDSB, no probes etc. So it's largely a guessing game, which I am basing around "Is there detritus in the RDSB? then, increase flow." So to Wrap things up, and I haven't mentioned this yet, I am planning long term to add a Spotted Mandarin Dragonette to the tank. The number 1 reason is I really like gobies and it's a similar "creature" to gobies. Second reason is that I think it will look absolutely great in there with the GSP I have, the colorations and markings are great. Third reason is that it won't compete for food with the Puffer at all. They are entirely different in their feeding habits. 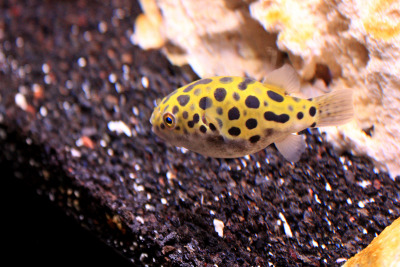 Complementary to the distinct food needs, the puffer's diet means there's a lot of "Excess nutrients" floating in the tank at any given time. I really want to establish a heathly copepod population that can feed on the Puffer's excess food. So as a counter balance to the copepods, I will have the Mandarin Dragonette. This plan of course requires that I establish a "thriving" copepod population first, so that's my immediate goal: Get some Tiger pods from the LFS, improve the lighting/algae growth in the "nano fuge" and see if I can get something established (a growing pod population). PostScript: Now, in the mean time, I will be raising these mollys in saltwater. One of the awsome thigns about the mollies I have is that every once in a while I have a few males born that are literally GUPPY sized. I know I know, they will compete with a mandarin for copepods, but remember, I don't have a mandarin right now. And if I can't raise mollies AND sustain a copepod population at the same time, Then I'll never be able to raise a Mandarin anyway. So once I have a stabilized Copepod population and the Mollies are still growing, I'll know I can move the Mollies into another tank and then introduce the mandarin. Anyway, I love Guppy-sized Mollies... and especially the idea that I can have some in a tank with live rock and potentially corals down the road. Hemmdog and Subsea like this. I got some Apoc copepods from one of the LFS (Apocyclops Paramensis) and added them to a few of my tanks. I read somewhere that Apoc pods are euryhaline, but I did not read the actual literature on it... Worse case I lose about 20mL of pods. These pods were from Heisenberg Aquaculture which I believe is local to where I live, so the pods are super "Fresh." The Apocs aren't on their site but I was able to get in store, not sure why. Either way, I'm happy I got the Apocs, being hopefully euryhaline enough to live in FW. Also, apparently Apocs won't outcompete other pods, so it's good that I got them first instead of Tigger or Tisbe pods. These copepods are the "second" foreign saltwater that I am introducing to the tank; what I mean by that, is the tank was started with only Caribsea Arag-Alive and Dry rock + low end brackish fish. So virtually any marine life in the tank had to have been killed or non-existent from the start of the BW to SW transition. The fish and rock was all at virtual hyposalinity levels (I hope I am using that word right). So what was the "first" foreign saltwater? The bottle of ARCReef Pink Fusion (spores + bacteria). And since then, I've added zero lifestock or corals or algae, only now adding the copepods. I bring this up because I did notice a few hairs, notably 1 cat or dog hair in the bottle of copepods, so I am not totally sure about the security of the water they were brought up in. However, that could just be a sign of the air supply and have nothing to do with cross-contamination of water. I mainly bring all this up because I try to be strict about QT and not introducing pathogens to the tank because I hate losing fish to illness. Anyway, I am very optimistic at this point, but I am not totally sure the copepods are going to be able to thrive in this tank, but that has less to do with the source than the current state of my tank (not a lot of diatoms in there). created a mini "pod" hotel in the "nano fuge" --I think this will be virtually useless because my dang mollies decided to have babies a day before I decided to get copepods. used a syringe and air hose to inject the copepods into the Sump's sponge filter and filter floss area--I think this is where the pods will thrive the best. They will have few predators (read: none if I remove the 3 tiny molly fry in that section of the sump), and they will have tons (relatively) of detritus to consume, plus nooks and crannies to hide in. injected some near the live rock where I hope they will inhabit and eat the diatoms taking over the rock. finally, I had to put Big Mama, my white molly, into time out for at least a day or two, to give the copepods time to inhabit the substrate and rocks. Big Mama knows how to do a few things pretty well and one of them is eat copepods. I also created a "micro-nano" habitat in the sump for one portion of the pods to live in. Basically I used the top half of a plastic water bottle and added a fine mesh to the bottom to keep the pods inside, but allow some water exchange. The half-bottle extends past the water line so nothing can get into the bottle unless it's coming through the mesh at the bottom. I also dosed this "micro-nano" space with some live phytoplankton I had on hand (in the freezer). I hope it's still alive, probably is. If my DT or Sump areas fail to strongly establish copepods I will still have this micro-habitat with them from which I can seed the tank spaces again. Impressive introduction. I like where you are going. I know nothing about zeolite use in biofiltration. Can you expound? Many nitrying bacteria will thrive in fresh, brackish or marine. I assume your choice of dsb was to accomplish denitrification. I have used both, I prefer algae filtration for nitrate management. I have so much coral biomass in my 25 year mature tank that it absorbs nitrogen faster than I can feed. I only read the beginning post in the first page. I was impressed with your dission to use phytoplankton to fight diatoms, which is a type of phytoplankton. Kudos to you. I will continue to follow your progress. For what you are doing, I suggest two seperate processes to manage nutrients: algae filtration and sponge filtration. For high ammonia processing, algae filtration is only exceeded by activated sludge that is commonly used in municipal waste water treatment. I have used mud filtration and continue to do so in 30G cryptic refugium that was converted from a mud/macro refugium, but mud filtration in a reef tank recycles nutrients and is passive. Algae filtration comes in many flavors. For reef tanks, the three that I am familiar with are macro refugium if you have the area space for it, then ATS & Chaetomorphy reactor are effective options. Because all photosynthesis creates dissolved organic carbon in the water column, either use activated carbon media to remove dissolved organics ( protein skimmers remove at best 25% of DOC while activated carbon removes > 70% of DOC ) or use cryptic sponges. Steve Tyree documents much recent research on cryptic sponge filtration. Simple put, cryptic sponges feed on DOC and produce DIC and Marine Snow, both of which are food for coral. Yes to copepods. I suggest a few differrent species than just Tigger Pods. AlgaeBarn has three seperate species that adds more depth to your diversity. Whether you are trying to seed a new aquarium or looking to boost Pod populations in your established system, 5280 Pods will get the job done. With 5280+ live copepods in every 16oz jar of 5280 Pods, you can rest assured that finicky feeders such as Mandarin Dragonets, Seahorses, Anthias, Corals, Clams, and other Filter-Feeding Invertebrates will always have a continuous supply of live, nutritious food. Our pods are 100% viable to reproduce within a marine environment. They grow and carry out their natural lifecycle in your aquarium. As some of the smallest mouths in a balanced ecosystem, a healthy population of Copepods is a critical, yet often overlooked part of any “Clean Up Crew”. We recommend using with our high-quality OceanMagik LIVE Phytoplankton Blend to establish and maintain the healthiest copepod populations. Packed with omega-3 fatty and amino acids, Tigriopus copepods make a nutritious meal for even the pickiest of fish. These Pods inhabit the water column and jerk around when they move, making them an easy target for your critters. Females will lay hundreds of eggs during their life cycle. They add to your “Clean Up Crew” by consuming detritus, invasive algae, and phytoplankton in your aquarium. These small and hardy tisbe copepods tend to inhabit the cracks and crevasses of live rock and macroalgae. 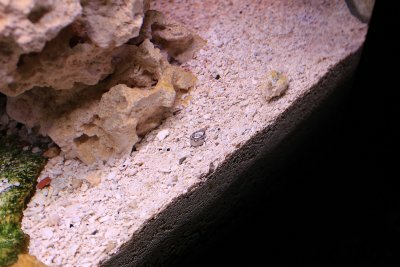 Hiding helps them to maintain their population in marine aquaria. Their nocturnal nature makes them a sustainable food source in your tank and keeps your fish entertained and “on the hunt”. Tisbe copepods make for a highly nutritious treat for your fish, while adding to your “Clean Up Crew” by consuming detritus, phytoplankton and invasive algae in your aquarium. Think of these guys as the smallest mouths in your food chain. These hardy copepods are slightly larger than Tisbe pods and slightly smaller than Tigriopus copepods. This intermediate size makes them a healthy live snack for your finicky fish and coral. Apocyclops copepods are extremely nutritious with a very high amino acid and protein content. Apocyclops copepods contain high amounts of Astaxanthin which can enhance and brighten the colors of your fish and coral. These warm water copepods reproduce extremely quickly by laying eggs every 4-6 days, about twice the rate of Tisbe and Tigriopus! Apocyclops copepods feed on phytoplankton, fish waste, and other detritus in your tank, making them a critical part of any clean-up crew. As juveniles, Apocyclops copepods are benthic, staying hidden in the rockwork, macroalgae, and glass in your aquarium. As Apocyclops copepods mature into adults, they lay eggs before becoming pelagic and making their way into the water column. Once in the water column, they provide a sustainable and nutritious live food source for your fish and corals. PLEASE NOTE: 5280 Pods contains a range of juvenile to adult copepods. Juvenile copepods are difficult to see with the naked eye upon arrival, but are best for establishing sustainable copepod populations. This is because livestock do not consume the copepods immediately after you add them into your tank! I know nothing about zeolite use in biofiltration. Can you expound? Thanks for checking my tank out! So for Zeolite, basically it develops biofilm like any other "substrate," so I just mean that with a decent flow through it, it will just act as a surface area for nitrification. There's no magic there from what I've read, bacteria more or less can't scavenge ammonia that's been adsorbed into the zeolite. Kudos to you. I will continue to follow your progress. For what you are doing, I suggest two separate processes to manage nutrients: algae filtration and sponge filtration. For the DSB, yep that was my original goal, denitrification, but I've decided the rewards for trying to get it working wouldn't be more effective than just using Chaeto like you suggested. So I'm working on getting some clean chaeto to put into my sump for algae filtration. 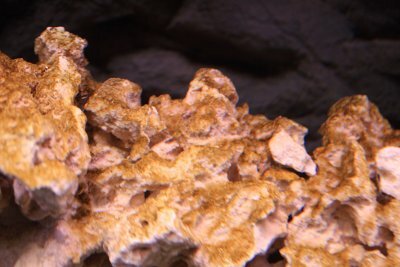 I'm also set on getting some live sponges, it looks like elephant ear and yellow ball are easiest to get to try at first, I'll either find some at an LFS or order from live-plants.com. One final thing, since I don't have a "super" skimmer (it's an airstone + compressor on a skilter 250), I am planning on adding about 1litre of purigen to my skilter compartment in my first chamber. Basically, I think Purigen is useful for organic removal and it's quiet, but the thing is, most people don't use enough of it to be worthwhile. That said, 1 litre is about 50 bucks, whereas a decent skimmer is 150+, so price wise it's not a "wash" either way (I can justify the purigen). I got an Eheim prefilter last night for 5 bucks on clearance, and it's attached to my skilter 250. So it's going to help trap detritus for breakdown in that prefilter which will then go directly into the "skimmer/purigen" area for capture or removal. It will be interesting to see if it works well. As complicated as it sounds, it's simple more or less. One thing about Purigen I believe is that it must be used early in a filtration process to be most effective, but that some prefiltration is needed to minimize clogging the granules. The philosophy I use to manage my tank, I more or less make marginal decisions on whether or not a change/mod is a net benefit, with the hopes that after enough changes, the tank will be stabilized, optimized and "healthy." I have enjoyed reading your thread to this point and will continue reading. I had a comment about mollies eating copepods, if they did, it would be negligible. Mollies are primarily herbivores. I have been skimmeress > 35 years . I find protein skimmers good for gas exchange only. In Ken Felderman articles on AdvancedAquarua, as as a research scientist he found protein skimmers ineffective at dealing with both DOC & TOC. He further postulated that removing free swiming bacteria skews bacteria populations, which could contribute to “old tank syndrome”. It is well known by reef microbiologist that more than 60% of the carbon manufactured in the reef environment is moved up the food chain by bacteria. To reduce flow I just need to cut a new plastic container with less holes than I have now... There's just too much turbulance how it's set up now, and I think the pods are getting flushed into the filterfloss/sponge section of the sump. Good show. You and I have parrellel thinking. When I recently spoke to @Randy Holmes-Farley on using a protein skimmer as a source of organic nutrients he postulated that “uv ruptures cell membrane spilling organic guts into tank”. I went ahead and routed the UV into the 1st chamber/refugium area of the sump, using the rainbird 1/2" connectors from HD and some vinyl tubing I had. I dont' have any clean chaeto yet, so I just stuck a bunch of polyfil into the "nano fuge" to slow down some water flow and also give algae and hopefully copepods somewhere to survive. I'm quaranting some chaeto right now, but I am having a hard time justifying 30 bucks for clean chaeto when it's 5 bucks to just buy and quarantine for a few months. Still, if algae gets out of hand in the DT, I'll probably get the clean chaeto from a LFS. Also, there's definitely something going on with the diatoms in the DT. They are disappearing from the dry rock in "specks and spots" and it's even happening from the drylok painted PVC pipe I have in there. I had a hypothesis that the rock was getting dissolved by the diatoms and then "releasing" the diatoms to show clean rock underneath, but the same thing is happening to the drylok and there's nothing to release from there... like calcium based material. So now I think it's either some eutrophic organism hopefully coralline algae or it's copepod nauplii eating the diatoms away. Copepods: I have seen zero adult copepods for the past few days... and I've looked very closely. I am not so sure that Apocyclops Paramensis is actually benthic as an adult. I think they are actually pelagic, and that only as nauplii are they benthic. I say this because i have some still in a closed bottle and the adults dont stick to the "surface" of the bottle, they float around in the middle of the water. So, i think reef nutrition might be incorrect with their statements about Apex-pods being benthic. I mean, I suppose it's an advantage that the adults can be eaten and that the juveniles are more likely to spend time on "surfaces" but I just like to watch adult copepods and it's frustrating to get conflicting information and then see for myself that they weren't what I was expecting. I think Tigger Pods might be a better choice because I know for a fact the adults are benthic, I have a bunch in my QT tank. Here is a video of either rotifers or Nauplii on my glass. I have no idea what they are because my 5 dollar Goodwill microscope broke and I need to get another one. As soon as I get a microscope I want to see what these creatures are, I really hope they are Apocyclops Paramensis nauplii. One final note. It's turning out that my Lava rock is really interesting. It's developing a "non green" type of fuzz/film to it that I am hoping will turn into coralline. It's interesting because Lava Rock is typically "sharp edged" like the bubbles that were formed when it was "made" and so it's easy to see the fuzz developing on the Lava rock, it's not the natural rock. Second, the diatoms that used to be on the Lava Rock are also "disappearing" like on the live rock, but in their place, it's the fuzz instead of "dry rock" (or black lava Rock in this case). I'll try to get a good picture next time I update. 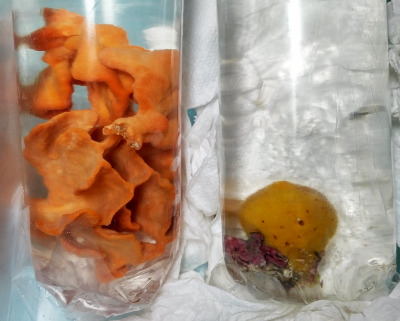 Post-Script: I ordered three sponges from Gulf Coast Ecosystems today, 2 Orange Ear and 1 Yellow Ball. Not sure yet if I am going to quarantine them when they get here... but I am anticipating adding them to the DT. Yes to orange ear sponge. I have bought from GCE for many years. Only recently in the last year have I noticed them. I have had my first one for 6 months and it continues to look shark. I like sponge power. Yes to copepods eating diatoms. Large amphipods eat cyno in my tanks. I go cucu over pods. The yellow ball is great, has coralline on the encrusted base. The bag distorts the photo, it's more round. Found a few hitchhikers (small brittle star and some worm-like larva on the yellow ball) still looking for more, but I don't have much experience with marine hitchhikers. have a puffer in DT that might have roundworms; so I want to move to QT tank w/ my acclimated marine mollies, and treat them all at once. Internal parasites is something I don't think fish can "fight off" effectively. I may put the sponges in the DT after a few days in a bucket w/ air stone, but I am worried my DT has elevated copper. Because of Seachem Flourite in my DSB and previous copper treatment with the lava rock.